Paytm CEO Vijay Shekhar Sharma isn’t taking attacks from competitors lying down. Sharma has once again accused HDFC Bank of letting its representatives badmouth Paytm to its customers. Sharma demanded a response from HDFC Bank on twitter, while sharing an account of a user whose HDFC’s personal banker had told her that Paytm wasn’t “safe for payment.” The HDFC Bank representative reportedly told them that Paytm’s data is stored online, and is thus not safe. They also added that since PayZapp’s data is stored on their own servers, it’s more secure. Just a month ago, Sharma had accused HDFC representatives of deleting the Paytm app from their customers’ phones. He’d shared an account of a senior Paytm employee whose uncle was an HDFC Bank customer. He alleged that an HDFC Bank representative came over to show them how to use HDFC’s own wallet, PayZapp. Once he’d installed PayZapp on their phone, he checked to see if Paytm was installed. On finding that it was, the representative allegedly deleted the Paytm app. HDFC, of course, competes directly with Paytm with its PayZapp app. PayZapp has over 5 million downloads, and performs many of the functions that Paytm does — it allows users to recharge their phones, pay bills online, and also has sections on travel, shopping and movies. It’s not limited to customers of HDFC – any bank’s users can download the app and link their credit and debit cards. This isn’t the first time an incumbent has raised questions about Paytm’s security. 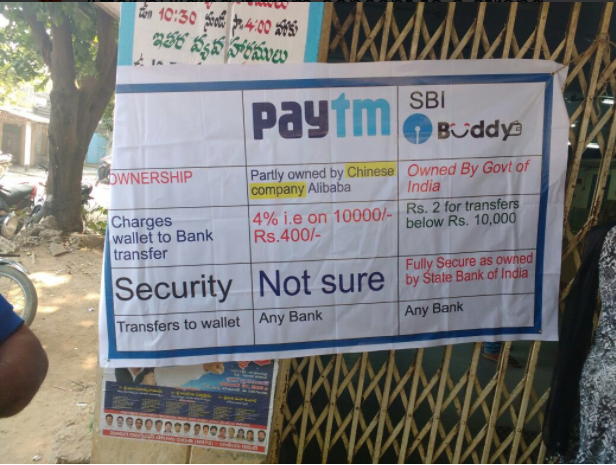 After the demonetization move last year, a poster had been put up outside an SBI Branch which compared Paytm unfavourably to SBI’s own wallet, Buddy. The poster had called into question Paytm’s ownership, stating it was owned by “Chinese company Alibaba”, while saying that SBI’s Buddy was owned by the government of India. It had also said “Not sure” against the security section for Paytm, while saying that SBI’s app was fully secure as it was owned by the government. Paytm has become a major player in the financial space in a few short years. Its wallet now has over 2.2 crore accounts, and it’s formally entered the banking space with the launch of its Payments Bank.